The dramatic revelation that five officers had allegedly lied on the witness stand in a Glenview drug case, has called into question dozens of other cases which the officers have pending. The Cook County State's Attorney's office will only say it is reviewing the matter, but privately, authorities are clearly concerned about a case which fell apart, when the officers were confronted with a video which contradicted their sworn testimony. That moment came two weeks ago, when the officers, three from Chicago and two from Glenview, testified at the Skokie courthouse, in the case of a drug suspect named Joseph Sperling. "All five officers were telling the same story word for word," said defense lawyer Steven Goldman. "They were caught in a lie." The officers testified that they pulled Sperling over under the pretense of a traffic stop, asked for his license and insurance, allowed him to exit his vehicle and walk to the rear, then removed a duffel bag containing marijuana. Only then, they said, did they arrest and cuff him. 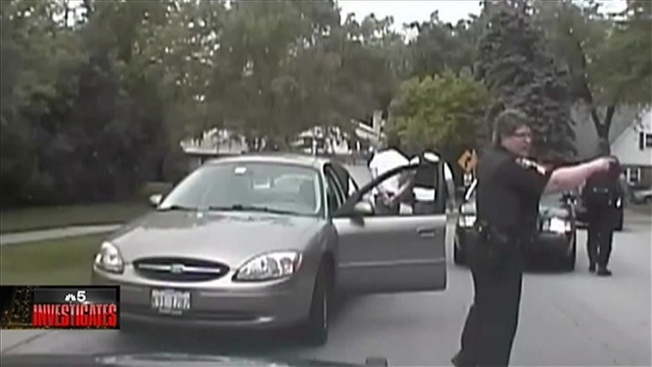 But Goldman confronted the fifth officer with the squad car video, which clearly showed the officers approaching Sperling's car and immediately taking him out of the car and putting him in handcuffs. Only then did they begin searching, finding the bag in the back seat. Prosecutors did not even attempt to clean up the mess. They offered no closing argument, as the judge immediately announced she was granting a defense motion to nullify the case. "Obviously this is very outrageous conduct," she said. "State, I expect you to do something about this, and to talk to all the superiors involved in this case. All of the officers lied on the stand today!" The Cook County State's Attorney confirms that an investigation is underway. But Goldman predicted that defense lawyers across the region are already preparing motions to have cases thrown out if any of the officers were involved. "They were caught in a lie," Goldman said. "So now you have the question of when else did they lie? What other times did they lie, where they weren't caught?" Among the officers was Chicago Sgt. James Padar, who recently made the rounds with his father, promoting a book, "On Being a Cop", about their father-son adventures on the Chicago Police Force. Padar also made headlines last year, when he was accused by a fellow officer of reneging on a home remodeling job. The officer said he did work on Padar's summer home, but the sergeant refused to pay him, saying he had falsified the officer's official city attendance records instead. That case is still pending. All five officers have been stripped of their police powers and placed on leave, pending investigations of the Glenview case.